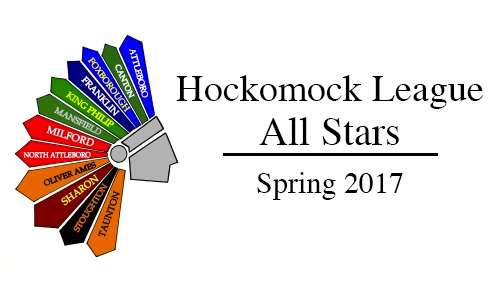 Below are the official 2017 Hockomock League Boys Tennis All Stars, selected by the coaches in the league. For a history of recent Hockomock League Boys Tennis All Stars, check out our history section. Taunton, 2 @ Attleboro, 5 – Final – Attleboro erased a two-run deficit with four runs in the fifth inning and tacked on an insurance run in the sixth to hand Taunton its second loss of the season. Big Blue scored on a bases-loaded walk, a two-run error and Dylan Maskell came through with an RBI single to give Attleboro a 4-2 lead. Matt Callahan (two hits) delivered an RBI triple in the sixth inning for Attleboro. Sophomore Eoin Kelleher earned the win with a complete game effort, allowing five hits while retiring five batters on strikes. Taunton, 11 @ Attleboro, 0 – Final – Taunton senior Courtney Fisher tossed a perfect game, retiring all 21 batters that she faced, in the Tigers’ win. Fisher struck out eight and made a terrific play, snagging a line drive up the middle with one out in the seventh, to preserve the perfect game. THS head coach Dave Lewry said Hannah Aldrich also made a great play in the first, playing a bad hop grounder off her chest and gunning the runner out at first. Jaime Brown was 2-for-2 with a walk and two RBI, MacKenzie Handrahan went 2-for-3 with an RBI, freshman Jaylin Couto went 2-for-3 with two RBI and a home run and eighth grader McKenzie McAloon had two hits, a stolen base and an RBI for the Tigers. Sharon @ Milford – Postponed to Tuesday, 5/9 at 3:45. Taunton, 4 @ Attleboro, 1 – Final – Taunton sophomore Brett Beaulieu didn’t lose a game at first singles to lead the Tigers to a win on the road. Junior Mike Briggs won 6-1, 6-1 at second singles, senior Eric Gwozdz notched a 7-6 (7-3), 6-4 win at third singles and the team of sophomores Dylan Kullas and Charlie Fiske won 7-5, 6-4 at first doubles. Canton, 5 @ Stoughton, 0 – Final – Canton junior Jake Wolicki didn’t lose a game at first singles and the Bulldogs won all five matches in straight sets to beat Stoughton. Wolicki won 6-0, 6-0 at first singles, Jeevith Chandrasekar won 6-1, 6-1 at second singles and Josh Diep notched a 7-5, 6-1 win at third singles. The team of Aidas Jakubenas and Dillon Anderson won 7-5, 6-1 at first doubles and Jake Troderman and Charles Malloy recorded a 6-0, 6-4 win at second doubles. Attleboro, 0 @ Taunton, 5 – Final – Taunton lost just a total of four game, winning all five matches in straight sets to earn a win at home over Attleboro. Olivia Sweeney (first singles), Jillian Pagliuca (second singles) and the team of Ashleigh Eason and Emily Moor (first doubles) all won 6-0, 6-0. Vanessa Rosa won 6-1, 6-0 at third singles and the team of Callie Hebert and Jordan Martin took a 6-1, 6-2 win at second doubles. Stoughton, 0 @ Canton, 5 – Final – The Bulldogs won all five matches in straight sets to earn their second win of the season. Emma Sokolovsky won 6-4, 6-0 at first singles, Jamie Cree recorded a 6-2, 6-1 win at second singles and Kiki Karavas prevailed with a 6-2, 6-1 win at third singles. The team of Julia Burkowsky and Caitlin Matthews won 6-2, 6-3 at first doubles and Sarah Hernandez and Stelina Michaelidis teamed up for a 6-2, 6-1 win at second doubles for the Bulldogs. Canton, 43 @ Sharon, 93 – Final – Canton’s John Guenthner qualified for states and finishes first in the 400M hurdles, crossing in 59.7. Riley McDonnell had a pair of second place finishes, clocking in at 1:01.4 in the 400M hurdles and 24.1 in the 200M. Canton’s 4×400 relay team (Amico, Milne, Guenthner, Graham) finished fist. Canton, 40 @ Sharon, 95 – Final – Canton’s Sarah Collins was a double winner, taking first in the 400M hurdles (1:11.1) and in the 800M (2:33.5) Erika Lum was first in the high jump (4-10) and second in the 100M (13.1) and Bronwyn Mahoney took second in the discus (77-1.5) and second in the shot put (30-9.5) for the Bulldogs. Mansfield, 55 @ Franklin, 81 – Final – Mansfield junior Madison Haughey was a double winner, taking first in the high jump (4-9) and the 100M hurdles (16.8), junior Angela Corkery finished first in the triple jump (32-4) and second in the long jump (15-2) and freshman Lindsey Goulding won the javelin (78-9). Mansfield’s 4×100 team (Olivia Horn, Emily Quitzu, Angela Corkery, Alexis Kiyanda) and its 4×400 team (Cassidy McMahon, Emma Oldow, Audrey Martin, Caitlin Whitman) both came in first.